The Month When i Found Myself Broke (i mean, REALLY BROKE) | Teefa Says.. In the recent month, I found myself struggling to manage financially.. What with Raya coming, an emergency that required me to buy a new (chic) bed, cheap holiday packages that are hard to resist, an irresistible sale at one of Malaysia’s leading jewelers.. Now I’m totally broke to the bones and i can’t barely live till my next paycheck!! This is soooo not me..
Usually every month, I give myself a pat in the back for my good behavior in managing my spending. Everything gets paid accordingly and within budget. But what oh what happened to me this month? Maybe this is the main culprit.. now that I’m officially an (young) adult (mind u, I’m just 23.. just because I have a job doesn’t make me an adult right? ), I have this urge to provide things for Raya. Langsir baru, duit Raya, a few pasang of baju raya, kueh raya.. Nasib baik lah Raya setahun sekali..
My old rickety bed is broken (retak menanti belah kah?). Without much hesitation I went to this furniture shop that I’ve been eyeing (but didn’t have any excuse to go to coz nothing was broken..haha!) and purchase this new black leathery bed with its leathery treasure chest friend. Now I have a nice bed to sleep and jump on and a chic treasure chest to store my handbags.. Pure genius right? Now these are my favourite purchase so far.. I bought a holiday package to Krabi, complete with return flight tickets, accomodation for 3 nights, tour package and airport shuttle. It’ll be an all-girls trip with my collegues in February! Another trip that I bought is a 3-nights trip to Bangkok, scheduled for April-May 2010. They’ll be 7 of us (insyaAllah! ), also an all-girls trip. I hear SHOPPING bell! Wow..seeing this list, I’m surprised why I couldn’t figure out where have all my money ran to. This is what happened when I got carried away.. Hurmpf! When all of these are over, expect me to return to my old cheapskate, think-10-times-before-u-buy self. 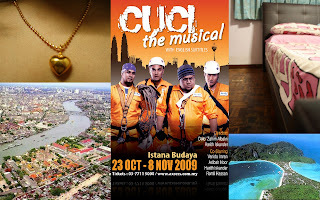 Heart-shaped pendant, Bangkok trip, Cuci the Musical tickets, my new bed (and tresure chest), Krabi trip.